Playing a chromatic-scale pattern is great way to exercise all four fingers on your fretting hand. In the following figure, you see two examples. The numbers indicate which fingers to use. Use alternate picking as you play up and down each chromatic pattern in order to improve the synchronization of both hands. To challenge your fretting hand more, use hammer-ons as you ascend the pattern and pull-offs as you descend, picking only the first note on each string. You can practice at your own pace, or confine your playing to eighth or sixteenth notes while following a metronome. 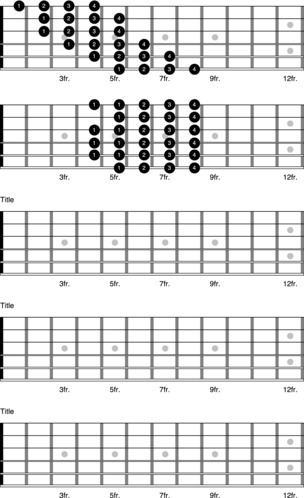 These chromatic patterns can be moved around the neck and started at any fret.